New York City’s bike infrastructure is expanding into new territory with new greenways connecting the city in a web of safer transportation options. And as it does, the Department of Transportation is working to significantly improve the bike lanes that already exist. In recent weeks, significant progress has been made on the Brooklyn Greenway—a planned 14-mile stretch of protected bike lanes along the borough's waterfront. Volunteers have been busy prepping an empty lot in the Columbia Waterfront District to become one of the Greenway’s many landscaped parks. This two-acre lot is designed by Rogers Marvel Architects. A little farther north in Williamsburg, the blog Greenpointers spotted new markings along Kent Avenue to connect one of the Greenway’s missing links. An existing on-street bike lane will be moved to create a two-lane, buffered bike path with more insulation from moving trucks and cars. And over in North Manhattan, the NYCDOT recently proposed two-miles of bike lanes for Washington Heights and Inwood. Farther south on the island, existing bike lanes in Tribeca and the East Village are being converted into protected lanes. 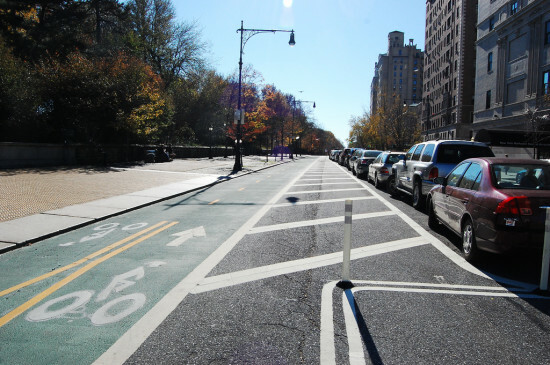 So what will all these bike lanes mean for New York? Are drivers doomed to sit in increased traffic? Simple answer, no. As Fivethirtyeight recently explained, "bike lanes, if they’re planned for the right streets, can be created without greatly increasing vehicular congestion." With the arrival of the Citi Bike share program just around the corner, and the Regional Planning Association’s Harbor Ring proposal gaining momentum, New York’s cycling community can now set its sights on the Brooklyn Greenway. The proposed 14 miles of bike lanes running from Bay Ridge to Greenpoint aim to provide a safe route for cyclists and pedestrians wishing to cross the borough. As Gothamist reported, the New York City Department of Transportation (NYCDOT) is preparing to begin construction on three more sections of the path, in Red Hook, Greenpoint, and the Brooklyn Navy Yard. In Red Hook, a connection is set to be forged between Columbia Street and Louis Valentino Jr. Park, with added bike lanes on Van Brunt, Imlay, Conover, and Ferris Streets. (See greenway map here.) 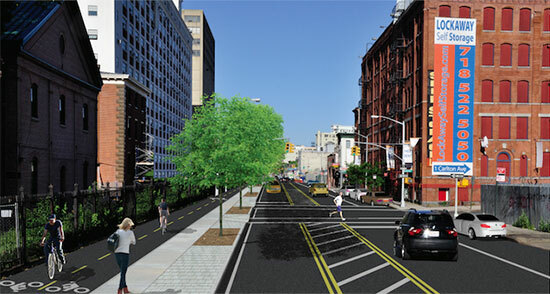 TNYCDOT is ready to begin construction on the $12.5 million project this summer. Meanwhile, the Wall Street Journal reported bike lanes have been approved along West Street in Greenpoint, while existing routes are set to be widened along Flushing Avenue by the Brooklyn Navy Yards. With a cost of $10 and $8 million respectively, these two projects are slated for completion in 2014.